Corruption presents huge dangers for Nigeria. Some in the US, in the Pentagon and the Department of Defense, already view Nigeria as a failed state. And they are also talking about redrawing boundaries in Africa. This is imperialism at its most aggressive. AFRICOM is designed to accomplish these plans, mostly by indoctrinating and enlisting African militaries to do the work for the US. China is using economic techniques, but both China and the US are after Nigerian oil and resources. The most effective way for Nigeria to consolidate its power, and resist the latest colonial aggression, would be to actively and sincerely fight corruption at home. Such a battle won’t be won overnight, but it must at least be engaged, so that the Nigerian people have some control over their government. Malam Nuhu Ribadu appears to have been engaged in this battle.
. . . power derives from corruption which in turn fuels and guarantees power . . . The tree of democracy cannot thrive on the compost of corruption.
. . . it is the ruling party itself, the PDP, that continues to suffocate the nation in its folds of corruption . . . (it is) the very quagmire of corruption, nurtured on corruption, sustained by corruption and dependent on corruption for its very survival. Let all sophistry be abandoned – the removal of Nuhu Ribadu is not about the removal of one individual. . . . The timing, when viewed with the recent call to re-open the case-files of unsolved political murders, will be regarded as a coincidence only by starry-eyed innocents from space – good luck to them. Those of us who have the slightest knowledge of behind-the-scenes manipulations since the trail of detection moved ever closer to the very apex of governance under the past regime, know that the nation was being brought closer and closer to the dismantling of one of the most sinister and corrupt governance machines that this nation has ever confronted – including even the incontinent reign of Sanni Abacha. Ribadu’s removal is therefore not an individual predicament . . . The issue is that an effective agency has been tampered with, unnecessarily, but with transparent motivations that constitute an assault on the corporate integrity of the nation. There is more, but I think these lines capture the heart of his message. I’m speechless! This must be a joke! Despite the EFCC lapses, Ribadu is one of the best officers (if not the best) in the Nigerian Police Force. Despite overwhelming influences from the powerful political community, he has done what can best imagined in Nigeria – fighting corruption. If this ill-timed study leave indeed marks Ribadu’s exit, I can only hope that his replacement finds the courage to continue the fight. Soyinka is absolutely correct when he writes the tree of democracy cannot thrive on the compost of corruption. Here in the United States we are beginning to see the destruction of democracy by an interwoven web of corruption. At a minimum, democracy means a majority of the people have a say in how they are governed, and how the monies of government are spent. Corruption turns those decisions over to a few people and corporate interests trading power and money. Nigerians may not know it but the man Obasanjo used to ram in support for his failed third term bid and in getting the last April polls to go his way, Nuhu Ribadu, has become active again in advancing pro-Obasanjo plans. Ribadu’s used his anti-corruption agency to discredit Obasanjo’s political enemies ahead of the April 2007 elections but his sins are now forgotten. He had produced reports indicting dozens of politicians, who were opposed to Obasanjo’s Third Term bid, and which INEC acted upon to bar such persons from contesting the elections. Courts have been reversing such decisions in ruling after ruling. To show that INEC was insincere, scarcely any of those so barred from the polls have been prosecuted six months after. There is more there, and it is worth a look. These things said, there are numerous possible explanations. As to the failed prosecutions, at first it looks like the actions of the Gonzales Dept. of Justice in the US, who forced US Attorneys around the country to prosecute Democrats running for office before the 2004 elections. Most of those prosecutions were later dropped or abandoned as without merit or evidence. They were a tool to discredit opposition candidates. However, prosecutions may be dropped for corrupt reasons, rather than lack of evidence, because of threats or bribes to judges and prosecutors, as Soyinka says has occurred. The state governors are often the nexus of corruption in Nigeria. So is Ribadu an anti-corruption hero? Is he a fixer for Obasanjo? He is certainly a hero in the eyes of many citizens of Nigeria, and to some, the last best hope against corruption. It is very difficult to advance in a corrupt system without participating in corruption. It is still possible to want to change things and to try to clean them up. He made enemies in the police force as well, both with prosecutions, and because his successes made the police look incompetent or corrupt. Hate him or like him, no one can deny the fact Ribadu brought in a commitment that has been unsurpassed in the history of the country in the fight against sleaze and combating the evils of financial and economic crimes in Nigeria. There may be truth in fears expressed in some quarters that the sacking of Ribadu may serve as the epilogue to anti-corruption crusade but the government should move in to assuage frayed nerves by appointing a committed person that is capable of continuing where Ribadu stopped. As General Buhari once declared, the fight against corruption is not a tea party. Ribadu himself has said that his agency’s commitment to prosecute powerful men and women engaged in sleaze has led to the killings of some of his officers. The dusk is closing in for a man who gave all to cleanse the country of rot. The bigger challenge is finding a man who will take over in this crucial period in the anti-graft fight that has led to the killing of some EFCC operatives. And anyone coming to take over from Ribadu must be ready to take up this challenge. 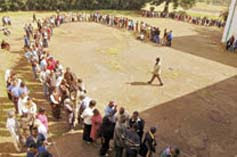 Kenya had record making heavy turnout for the elections today. People wanted, and took advantage of their chance to participate and vote. And from what I read so far, things went well. People had to wait in long lines, but it was generally peaceful, and people were able to cast their ballots. Heavy turnouts usually signal people want a change of government, but the results are not yet in. You can read more at AllAfrica.com, and the AllAfrica blogs on Kenya. If you click these last two links, by that time all the information may be updated, and we may know more about the results. ODM presidential candidate Mr Raila Odinga finally voted on Thursday at 12.36pm. Earlier in the morning, Raila and his wife, Ida, had failed to cast their votes because his name was allegedly missing from the Electoral Commission of Kenya (ECK) LangÕata constituency voter register. Moving over to South Africa, Dibussi Tande has collected selections and links to a number of South African blogs that discuss the recent party congress that elected Jacob Zuma to be President of the ANC, which means Zuma is likely to be the next President of South Africa. He has proven to be a populist and to the best of my knowledge has not shown much interest on the region as a whole. If he chooses to be a domestic leader, like he seems he will, his election will indeed end up being a loss to the African people who desperately need visionary continental leadership to correct the evils of poverty, disease, ignorance and bad leadership. There are a number of other bloggers who express both optimism and doubt about Zuma’s potential as a leader, and his strengths and weaknesses. All have points of view worth considering. And in Nigeria Yar’Adua has removed Malam Nuhu Ribadu as Chairman of the Economic and Financial Crimes Commission (EFCC). Ribadu has been ordered to attend a compulsory one year study at the National Institute of Policy and Strategic Studies (NIPSS), in Kuru near Jos. Ribadu has gotten a lot of credit for cracking down on the 419 scammers. But it also looks like he may be a fixer for Obasanjo. On Dec. 22 I quoted from an article by Tony Eluemunor, who is Abuja chief for the Daily Independent. Nigerians may not know it but the man Obasanjo used to ram in support for his failed third term bid and in getting the last April polls to go his way, Nuhu Ribadu, has become active again in advancing pro-Obasanjo plans. Ribadu is the Economic and Financial Crimes Commission (EFCC) chairman. It is said that after meeting Obasanjo in early June, Ribadu began to arraign Yar’Adua’s former governor colleagues, distancing them from him, so that if the presidential poll was cancelled, Yar’Adua would have scant support among his former co-governors. Yar’Adua’s ratings had remained high everywhere until Ribadu began to spread the message that the President was shielding his former co-governors from being prosecuted for corruption. So it looks like Yar’Adua is consolidating his position. It will be interesting to see how this plays out. 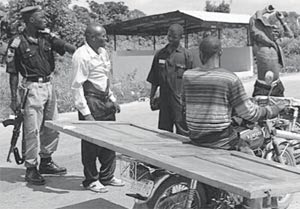 Policemen keeping the peace stops and searches youths on the Buguma Road in Ogbakiri, about 50 kilometres from the oil city of Port Harcourt in the Niger Delta: Armed groups have been demanding autonomy and greater control over oil resources in the Niger Delta. Tony Eluemunor has written a fascinating summary of the current Nigerian political situation with his article Nigeria faces a tunnel at the end of the light. Conflict is increasing in the Delta region, and seems to be expanding, as this report would indicate. There are more violent actions, and more threats of violent action. As Eluemunor reports, Yar’Adua’s election is still under a challenge that may succeed. If the challenge is successful, Nigeria’s constititution may not be up to the resulting situation. So far, tribunals have invalidated the elections of five state governors. It is expected that over 26 of Nigeria’s 36 state governors will be thrown out by the tribunals over election rigging, thus giving a judicial approval to the widely held belief that the polls were flawed. The presidential election could also be invalidated. The President could remain in office, or the Senate President might temporarily take over. If the election is invalidated, the constitution mandates a new election must be held within three months. This time frame would be the real source of the danger. A large percentage of Nigerians have no faith in the Independent National Electoral Commission (INEC) leadership, which has been roundly condemned for conducting the worst election in modern times, to handle the expected presidential elections. This mistrust is buttressed by the fact it has been demonstrated that the INEC chief was sponsored into that sensitive position by Uba, a former aide to Obasanjo, whose election as Anambra State Governor lasted for only three weeks.
. . . An updated voters’ register is long overdue and its preparation will certainly take more than 90 days. There is also the possibility of having an interim national government, which the Obasanjo camp is waiting for as is the former military president Ibrahim Babangida’s group. Yar’Adua faces opposition within his own, and from opposition political parties. His own party may oppose him as candidate. The opposition is gearing up. And Obasanjo is still manuvering for legislation that would allow him a third term. Ribadu’s used his anti-corruption agency to discredit Obasanjo’s political enemies ahead of the April 2007 elections . . . To show that INEC was insincere, scarcely any of those so barred from the polls have been prosecuted six months after. In the Delta the Navy says it is preparing to handle the insurgency in the country’s Niger Delta region because the region had become more complex for ordinary security agencies to manage. The belligerence in the area was being subdued when on September 3, Henry Okah a kingpin in the Niger Delta insurgency and his seafaring companion, Captain Edward Atata were arrested in Angola for alleged gun running. Okah became prominent two years ago when he demanded the release of two Ijaws then facing trial – former Bayelsa Governor Diepriye Alamaiseye and Asari Dokubo, head of the Niger Delta Volunteer Force. When the two men were released, Okah announced that MEND would unilaterally cease hostilities for a while to allow the newly elected Yar’Adua time to settle down and work on his electoral promises. Thus, while other armed Delta militias degenerated into hostage-taking and were being denounced as mere criminals, MEND remained above that recrimination and even threatened to join government forces in ending the hostage-menace. Okah’s arrest in Angola has derailed the rapprochement between MEND and the government that had been achieved after President Yar’Adua’s inauguration in May 2007. The Delta insurgency looks certain to become worse next year as the MEND accuses the government of conniving with Angola to arrest Okah. However, Yar’Adua’s request that Angola should extradite Okah to face trial in Nigeria is bound to keep the MEND belligerence in check, at least until it becomes clear whether the government would jail Okah or release him to appease to the people of the Niger Delta. But as things are, even if Okah were allowed to walk away a free man on his return from Angola, there would be a new cause for concern with the rivalry between two militant groups in the delta escalating into a turf war. This rivalry heightened when the leader of the Niger Delta Volunteer Force, Alhaji Asari Dokubo hailed Okah’s arrest describing him as a mere criminal. It would appear that there is no way out of the dilemma. to arms whereas Dakubo will cause problems if the rival goes scot-free. Shell is already talking about moving some operations out of the Delta, and the other oil majors may follow. So Nigeria may face financial setbacks that will exacerbate the political problems. If Yar’Adua’s election is not nullified, the storm may die out. If it is, a titanic fight that might see the generals in power again could break out. People have began to speak about this possibility in hushed tones but there is a feeling that a military government would be resisted, its excuse of restoring sanity and filling a power vacuum notwithstanding. The military option emerged during Obasanjo’s bid for a third team. Unfortunately, it has not fully receded and the feared power vacuum, should the polls be annulled, is not making things any better. The quid pro qui from the US for Yar’Adua’s government for endorsing the AFRICOM idea is the pledge to help him surmount the political brickbats being hauled at him from both his own political party, the PDP, and the opposition parties. The US government knows that Yar’Adua’s government lacks legitimacy. Yet, Bush deliberately refused to comment on the election heavily censured by both local and international observers. By so doing, the US president left open a tiny window of blackmail. This is pay back time and the American establishment is pulling the strings. It is not by mere coincidence that Yar’Adua’s state visit to the US came at a time when it is rumoured that he may have lost favour with the PDP hawks, who have reportedly concluded plans, in the even of the tribunal annulling the presidential polls and calling for fresh election, to field a presidential candidate other than Yar’Adua. This is what happens when a government lacks legitimacy as Yar’Adua’s obviously does. The man at the driver’s seat looks up to external forces to sustain himself in power rather than the people that elected him. But it is a dangerous gamble. In a world where the unwritten code of international engagement seems to be, as Bush himself once put it “you are either with us or against us,” all those fighting US global hegemony are bound to see Nigeria as an adversary, being a military ally of their enemy, the US. [T]he American-led war on terrorism was designed primarily to “secure Western access to other people’s natural resources without being ready to pay economic market prices and compensations for these resources. AFRICOM, will be structured as an inter-agency command with State Department and U.S. Agency for International Development officers filling positions usually reserved for uniformed personnel. A great deal of AFRICOM’s mission and focus will be determined by the countries in their area of responsibility — those on the African continent. Bush killed dozens of Somali civilians in bombing raids on fleeing civilians in an attempt to knock off a couple of the alleged dastards. He failed, of course; but at least the men, women and children who had their guts ripped out and their heads blown off and their limbs torn from their bodies died in a good cause. . .
It’s “worse than Darfur,” says the UN’s humanitarian chief, John Holmes. Actually, there is no more reason to believe the Bush administration promoted this war, in clear violation of international law and the UN Charter, ‘to catch a handful of al-Qaeda men’, than that the invasion of Iraq was to eliminate weapons of mass destruction. What has unfolded over the past three months flows from much larger strategic calculations in Washington. On file are plans – put on hold amid continuing conflicts – for nearly two-thirds of Somalia’s oil fields to be allocated to the US oil companies Conoco, Amoco, Chevron and Phillips. Nigeria has a lot more oil than Somalia, at least from what is known to date. Bush must be thrilled to be partnering with Nigeria. And this partnering is already going on, with Nigeria, and a number of other countries. It was going on before Yar’Adua’s visit to the White House. You can see the pictures of partnering at work, training, conferring, and assisting, at the photogallery of the African Partnership Station, the USS Fort McHenry, currently deployed along the coast of West Africa, and partnering with a number of countries. You can type the name of a country into the search box on the upper right of the page, and see related pictures where the APS has visited. I don’t know if the USS Fort McHenry docked in Nigeria, but it did engage in some training activities with Nigerian military. AFRICOM is already in the neighborhood. Note: Thanks to the article by Werther at antiwar.com for the title of this post. What does Partnering with AFRICOM mean? I wrote a guest column on what partnering means. Check it out at the African Loft. Has Yar’Adua been bought out by Bush and AFRICOM? 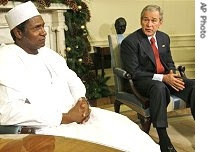 After meeting with Bush at the White House, Nigeria’s President Yar’Adua appears to have reversed direction and announced Nigeria is ready to “partner” with AFRICOM. To understand what partnership means, see my earlier post on how it works in the Philippines, and how that relates to AFRICOM. Partnership may provide the US with everything it wants and needs, both access and resources. I don’t know what combination of bribes and threats were directed at Yar’Adua, but combinations of bribes and threats are how Bush and his cronies do business. The story was reported by This Day, and in allAfrica.com: Nigeria: Yar’Adua in White House, Ready to Partner U.S. On Africom. President Umaru Musa Yar’Adua yesterday at the White House in Washington, D.C., United States (US) stated that Nigeria would partner the US/AFRICA Command (AFRICOM) on security on the continent. The Council of States of which the President is Chairman, recently voiced opposition to the command. Minister of Foreign Affairs, Chief Ojo Maduekwe, who is part of the President’s delegation to the US had himself stated that Nigeria would not support the presence of US troops on African soil under the auspices of AFRICOM. But at a press briefing at the Oval Office, with President George W. Bush in attendance, Yar’Adua made known his new position. “We have discussed on security issues, security within Nigeria, the Niger Delta, the Gulf of Guinea and peace and security on the African continent. We shall partner AFRICOM to assist not only Nigeria but also the African continent to actualise its peace and security initiatives. It is an initiative to have standby forces in each of the regional economic groupings in Africa,” said the President. The President did not give details of the discussion on AFRICOM, such as whether Nigeria will be used as the Command’s base, an issue that has emerged contentious in recent times. But his support at the White House was a clear departure from the leaning of his administration on the issue. This disclosure is opposite of what was disclosed by the Nigerian government in November, and clearly contrary to general expectation of AfricanLoft users (See AfricanLoft debate on AFRICOM) and the Nigerian public. It will be a grevious mistake in the long term if Nigeria i.e. Yaradua deviates from his earlier decision and partners with the US on AFRICOM. It will be interesting to hear in the near future his full explanation and reasoning behind changing his mind. Leaders are accountable to the people for when the problem starts, the people are the same that would suffer for it. Again, referring to my earlier post, Bush’s AFRICOM may not need much of a geographic headquarters to accomplish what it wants, if it can get enough African “partners”. It is very pleasant to report some good news! 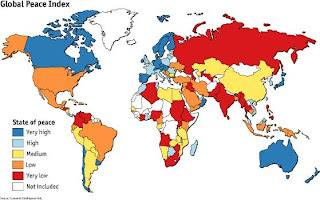 Ghana ranks High, number 40, as one of the more peaceful nations in the world on the Global Peace Index, developed in conjunction with the Economist Intelligence Unit. Ghana scores high above the United States, which ranks Low, and is number 96 out of 121 countries rated. The full list of rankings is here. Peace and sustainability are the cornerstones of humanity’s survival in the 21st century. The major challenges facing humanity today are global – climate change, accessible fresh water, ever decreasing bio-diversity and over population. Problems that call for global solutions and these solutions will require co-operation on a global scale unparalleled in history. Peace is the essential prerequisite, for, without peace, how can the major nations of the world co-operate to solve these issues? Emphasise the need for governments to consider the drivers of peace in policy decisions. You can see Ghana’s scores in detail here. It’s fascinating to compare the indicators between different countries. For example, in New Zealand the level of distrust in other citizens is 2 (scale of 1-5, where 1 = most peaceful), whereas in Israel (119 on the index) it is 4. In Norway, the level of ease of access to small arms is 1, while in Iraq it is 5. The study also sets out a range of potential determinants (“drivers”) that may “influence the creation and nurturance of peaceful societies”. These include functioning of government, 15-34 year old males as a percentage of total population, importance of religion in national life, and number of paramilitary personnel per 100,000 people. A society’s ability to deal with competition, conflict, grievance and aggression through lawful, regulated and fair mechanisms, e.g., a functioning legal system, parliamentary democracy, and sports. Equable access to natural resources (such as clean water) and recreational space, fair pricing for essential commodities and services (like electricity), and statutory protection for rivers, forests and other life sustaining ‘natural services’. An ethos of sustainability – which emphasizes living simply and within one’s means, rather than zero sum competitions with others for money, resources, and prestige. I’d add effective local level govt which provides its citizens with an adequate level of basic services – sewerage, refuse collection, power etc etc.